Lots of great news. Major highlight: The benches will be here by end of May! Plus a great new video testimonial and a foreword for the book. Construction of the first batch of benches is underway. They’ll move fast, so order now! Delivery is set for the end of May–about a month after the Expo at the end of April, so I’ll be taking orders there. Cushions are on order, too. The bench will fold, so it’s easy to move and put away, if need be. 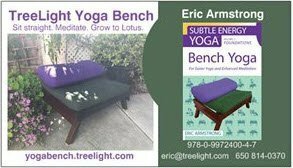 Yoga teacher Urvish Mahida sat on the bench for a while, and gave it this ringing enorsement–particularly for pranayama and meditation! The design for the latest business card is at the top of the page. Next up, a banner for events and expos!